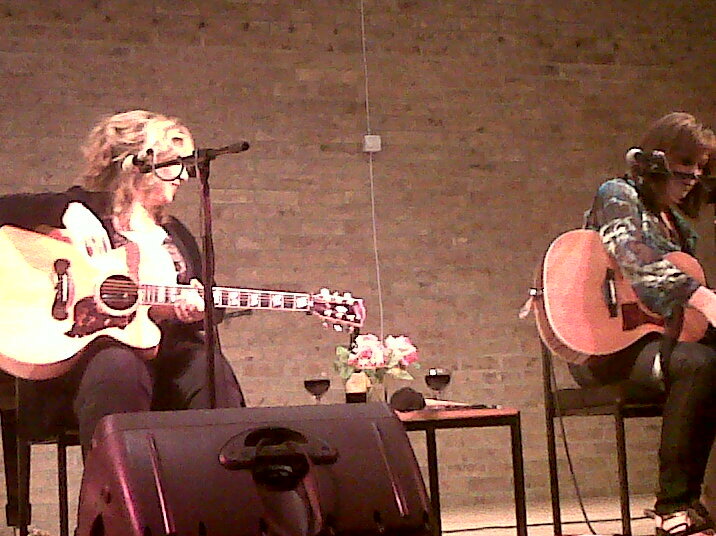 Last week I was lucky enough to listen to a rare "Wine, Women and Song" performance in the UK. "Wine, Women and Song" consists of country singer-songwriters Matraca Berg, Gretchen Peters and Suzy Bogguss. While the three of them are well known for their singing skills they have also written songs for some of country music's modern day superstars. Trisha Yearwood for instance covered Gretchen Peter's "On A Bus To St Cloud". The whole night had a incredibly relaxed atmosphere and the three women sipped wine, laughed and joked throughout the night. They seemed so relaxed within each other's company and it's obvious that they get on well. As a trio, the three of them have successful tours under their belts in both the UK and the US and it was clear from the audience that many people had come to see them more than once, some people even over from America! There were various songs that led to sniffs from various members of the audience but it was around halfway through when Gretchen Peters walked over to the piano to play "On A Bus To St Cloud" that made me emotional, as did Matraca Berg's amazing title song off her new album "The Dreaming Fields". I find that with country music artists often pour all their experiences and emotions into their songs and all three of the women took the audience to different places during the night with ease. All three of them are obviously skilled musicians and they altered between different instruments during the night, Matraca playing guitar and harmonica, Gretchen playing guitar and mandolin and Suzy playing guitar and drum box. It certainly wasn't simple melodies either and this just served to add to the appeal of the songs. They carry with them a lot of respect from their contempories in America and more specifically in Nashville and they live up to it. Not only did they play their own hits, they also sang songs by other well-respected country artists such as Tom Russell's﻿ "Guadalupe" which the audience seemed to really appreciate. After the concert Gretchen, Suzy and Matraca all graciously came out in to the foyer to sign cds, take pictures and generally talk to their fans. I had a moment to speak to all of them and they are all such genuine people and real sweethearts. They seem to gladly take the time to speak to their fans and were all quite happy to sign multiple cds and posters. All in all it was a brilliant night and something I would definitely recommend to anyone, whether you like country music or not. It was such a gloriously relaxed atmosphere during the night and I would definitely go and see another performance from the three of them. At the end of the night I bought the latest album's from all three women and can definitely recommend them. 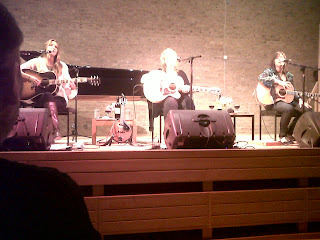 They are Gretchen Peters' "Circus Girl", Matraca Berg's "The Dreaming Fields" and Suzy Bogguss' "American Folk Songbook". Couldn't give these three anything other than five stars - brilliant!